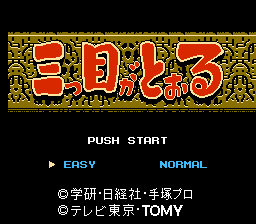 Mitsume ga Tooru is an action platformer game for the Nintendo Entertainment System. Based on an anime/manga with the same title. Nothing much to say here. It’s a small, quick, complete translation. Download the patch and discover this game’s majesty. If that’s even the right word. I think it is though.